I love Thanksgiving. I love spending all day in the kitchen cooking a dozen different dishes. After nearly two decades of cooking Thanksgiving dinners, I’ve got my system down pat….and as long as the rest of the family steps in to wash dishes every once in a while and preps the rest of the house for Thanksgiving day guests, then I’m happy to cook for 6 hours. Typically, I like to keep my meal-preparation time down to as short a time as possible. The other thing I love about Thanksgiving (probably even more than cooking all of my special holiday dishes) is eating Thanksgiving leftovers for days. I love all of the leftover turkey but I admit that even turkey eaten the same way (mashed potatoes and gravy, stuffing and cranberry sauce) can get old after two days. This year, I found a delicious (and I mean DELICIOUS) way to mix up the turkey leftovers. This panini is so tasty that you’ll want to make it all year…and that’s totally doable with some sliced rotisserie chicken. 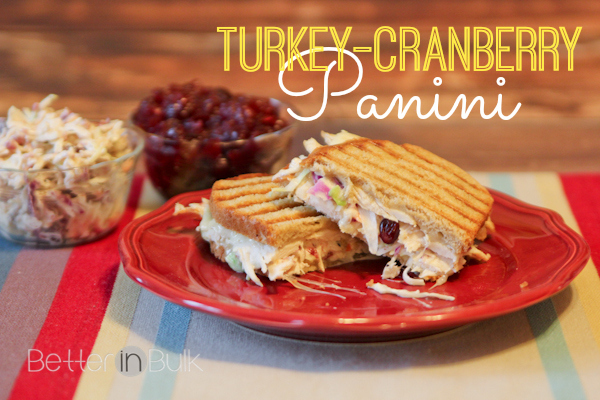 I found this recipe on Panini Happy (oh my goodness! If you love paninis, you must check out this fabulous site!) and fell in love with this combination, based on the classic Reuben sandwich. In a small bowl, mix together the mayo, cranberry sauce, horseradish and Worcestershire sauce. Season with salt and pepper to taste. Toss with cole slaw mix. For each sandwich: layer one slice of cheese, a slice of turkey (or two), a few spoonfuls of the dressed cabbage, and another slice of cheese on a slice of bread. Top with a second slice of bread. Spread butter on both sides of the sandwich. In a panini press or on a griddle or frying pan, cook sandwich until the cheese is melted and the bread is toasted, about 4 minutes. If you’re not using a panini press, be sure to grill on both sides, and you may want to press the sandwich down with a plate or wide spatula while it’s cooking. 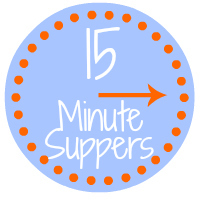 Today the #15MinuteSuppers bloggers are bringing you some tasty leftover ideas! I will have top save this for our after Christmas leftovers. We always have more turkey after Christmas because we never have anyone over. I could eat this! Have to just pan grill it since I don’t have a panini. This is a great Thanksgiving leftovers recipe, yum!! Cant’s wait to try this one, thank you for sharing this recipe. This looks absolutely delicious! So great for all your left overs and its not boring. I love your panini….looks scrumptious! I know my hubby will go crazy over this sandwich. I love paninis and that sounds amazing!